Personal Note from Editor: YES! FINALLY! We are so excited for this premiere and to have been a part of the filming and promotions process. This is a huge deal and accomplishment James and for Morehead City, Big Rock, Calcutta, Todd and Harry! This is the start of BIG things for all of them! Congratulations! James Wesley’s head-turning talent is winning over Country fans across the nation, hook, line and sinker. After the success of his first two chart-topping singles, “Real” and “Didn’t I,” the Broken Bow Records recording artist will soon debut the video for his latest single “Hooked Up,” in partnership with Calcutta, in an exclusive premiere across CMT platforms on Monday, August 31. Co-written by Todd Morris and Harry Smith, the upbeat angler’s anthem tells the story of a blue marlin who is being pursued by fisherman at the Big Rock, a legendary fishing spot off the coast of Morehead City, NC. An avid sportsman himself, Wesley identified with the song and was eager to record it. 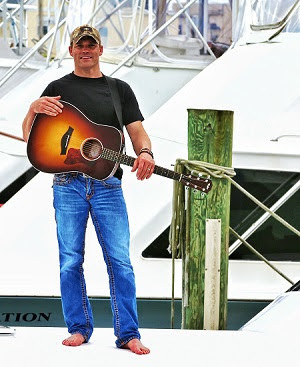 Announced in April, Wesley formed a partnership with Calcutta to shoot the “Hooked Up” music video and promote the song to the sport fishing communities. For each “Hooked Up” single downloaded from iTunes, proceeds will go to support the American Sport fishing Association’s “Keep America Fishing Program” and the Big Rock Blue Marlin Tournament Charities. Both charities promote sport fishing, and help to keep oceans, lakes, rivers and streams open, clean and abundant with fish.